The major worry for the travelers, always short of money, is to find a place to sleep or spend the night when traveling around the world. But what if you have a mini van, that resembles an ordinary rickshaw, that can take care of all your traveling and night spending woes? Well here is something unique, economica and taking all your worries if you elect to travel by road in your very own 'all-in-one' mini van. 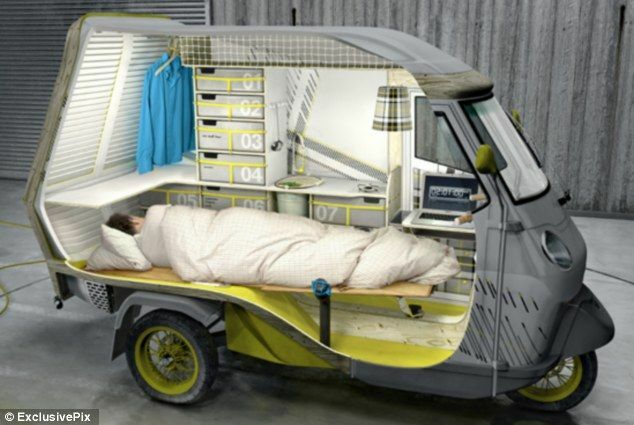 The designed based on Piaggio scooter and similar to tuk-tuk rickshaws provides you a companion that will take you away from expensive and uncomfortable motels, as in foreign lands the motel owners are known to fleece the lone travelers.